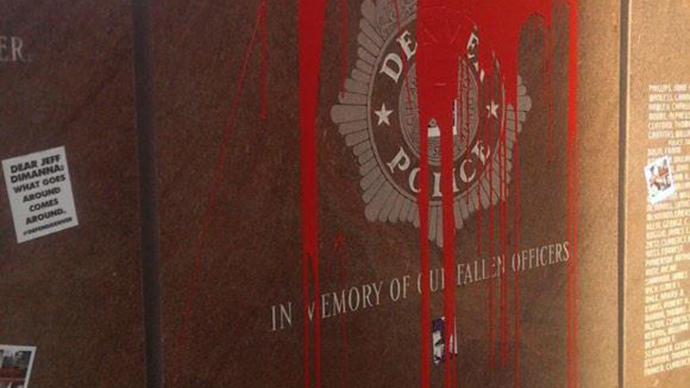 Denver police’s treatment of protesters has prompted anger in the ranks, with calls for DPD chief to resign after police memorial was vandalized. Officers are incensed over the chief’s handling of the incident, while the department is defending what it calls efforts to avoid conflict. President of the Denver Police Protective Association Nick Rogers called Sunday for the resignation of Police Chief Robert White. “There is no reason to allow someone to desecrate a memorial,” Rogers told the local CBS affiliate, calling on 1,400 officers to sign a letter to the mayor demanding White’s dismissal. “We have a breaking point, and we are there,” Rogers added. CBS quoted an email to Chief White by Officer Danny Veith, who called the orders to watch the vandalism of the police memorial “inexcusable and unacceptable,” adding that “Equally alarming is the escalation of anti-police rhetoric in our city, incendiary language and actions that have yet to be countered by city leaders, the mayor, or yourself." In an email obtained by the Associated Press, White explained that “intentionally avoiding direct confrontation prevents injury to officers, limits liability, and minimizes the criminal actions of many protesters.” Denver Director of Public Safety, Stephanie O’Malley, praised the department’s conduct as “a model for other cities as they respond to a growing wave of protests across America,” reported the Colorado Springs Gazette. Denver police adopted the policy of non-confrontation following a wave of protests against police brutality around the country, which began last summer after the fatal shooting of Michael Brown in Ferguson, Mo. and the choking of Eric Garner in New York City. Officers involved in both incidents were cleared of any charges by the grand juries, prompting more protests and even riots. Protesters rallied Saturday outside the police headquarters, demanding “justice for every single person who has been killed, maimed, kidnapped and wounded by Denver police," as per a flier quoted by the Denver Post. The flier listed the names of five people recently injured or killed by the Denver police, including the 17-year-old Jessica Hernandez, fatally shot on January 26.